Conventional storage tank water heaters have been used in commercial and residential applications since the early twentieth century. While most household electronics have taken great strides in terms of new technology and efficiency, the traditional tank water heater has not. Most consumers do not need a lesson in the inefficiencies and problems associated with traditional water heaters as we have all experienced them at one time or another. With energy costs continuing to rise and interest in household technology and environmental stewardship at an all-time high, the concept of "on demand" or tankless water heating has increase dramatically in popularity during the past decade. The general premise behind a tankless water heater is to only heat water "on demand" as it is needed. This eliminates the need for a storage tank and dramatically increases energy efficiency. 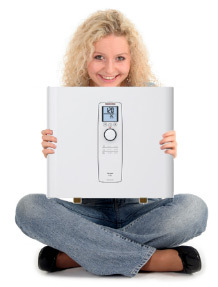 Almost every major shortcoming of a conventional water heater is addressed by a tankless system. 20-40% of energy consumed by a traditional tank heater is wasted as heat is slowly lost due to radiant heat loss from the storage tank Reduce water heating costs as much as 50%! - Tankless water heaters heat entirely on demand only when hot water is needed. Since there is no hot water storage, thermal heat loss is almost completely eliminated. Conventional water heaters frequently run out of hot water after several back-to-back demands and often after only one shower or demand. The user must then wait for a long period of time for the heater to "refresh" Tankless heaters never run out of hot water - they can literally run all day long if necessary and they will never stop producing hot water since they heat water instantly on demand. To ensure a traditional heater refreshes at a reasonable rate, most heaters are set at very high temperatures (130F+). This wastes energy and increases risk of scalding, especially for children and the elderly. Sophisticated tankless heaters allow you to set the ongoing water temperature to a much more reasonable and safer temperature, closer to the actual temperature you will use the water at, thereby reducing risk of scalding. According to the US. Department of Energy, for each 10°F reduction in water temperature, you can save between 3%-5% in energy costs. Conventional water heaters typically last from 6 to 12 years in most residential applications. They are bulky and take up a huge amount of landfill space and are costly to recycle. Tankless water heaters can last more than 20 years. Due to their large storage tanks, conventional water heaters are bulky and take up lots of space. Tankless water heaters are about the size of a briefcase (electric units) - they save valuable floor space that can be used for storage etc. especially in condos and apartments.